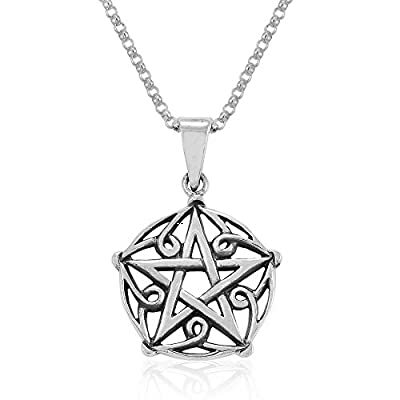 This Sterling Silver Wiccan Pentagram Pendant Necklace from Mimi is a gorgeous little piece that is neither too big or too small! It has a nice weight and feel to it and is big enough to be noticed...and complimented - while also being discreet enough to not scream out "PENTAGRAM" as you wear it! Our Sterling Silver Wiccan Pentagram Pendant Necklace is made of High Quality Sterling Silver with 925 stamped for authenticity. These sterling silver pendants are a must-have for every jewelry collection whether it be Wiccan, Gothic, Celtic or just everyday wear with an appreciation for the style. Comes complete with sterling silver chain necklace 18" long (0.8 mm thickness). This piece has been Rated 5 stars by many previous purchasers and is a pendant that will soon become one of your favorites!